Why Is This Man Shouting? If you’re visiting our website, you probably received our Save the Date postcard. If you received our Save the Date postcard, you probably wondered what the story was with the photo on the front. The photo, which we found via Shorpy, is from 1937. 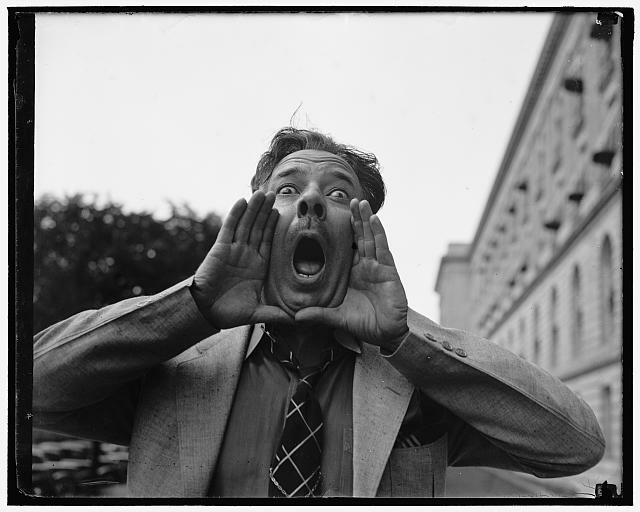 Rep. Robert L. Mouton of Louisiana, the man in the photo, is practicing for a hog-calling contest with Rep. Otha D. Wearin of Iowa. Mouton withdrew from the contest, so we’ll never know which state truly has the best hog-call.